It was H.C. of LAOCFoodie who secured the reservation and I jumped on the Twitter call to secure my spot in the Hatchi craze that was – this time – Top Chef and James Beard Award finalist Michael Voltaggio. Other foodie counterparts present included Kung Food Panda, Pepsi Monster, Christine of Folie Ã Choi Sauce, Hey Hey Scenesters, Follow PK plus many more inside. Kevin Eats, My Last Bite, Betty Hallock of the LA Times – all of which I had the pleasure of finally meeting for the first time (unfortunately not inclusive of Oishii Eats) – had dining room spots. And so did Tony. Yes, they were all seated in the inside of the restaurant while our table of 7 was banished to the outside. As indicative of the service quality bar set for the night – things were so slow that they set us up at a table in the Century City mall. For a temporary post at BreadBar, there were all the excuses available for the service to be slow and disorganized – but I think to the extent that it interfered with guests’ enjoyment of Voltaggio’s art, the service model should be reexamined. It was a packed night, for sure. If you were so much as paying attention, you’d have realized that you had the chance to enjoy modern cooking or, if you will, “molecular gastronomy” for $8 a pop, 8 times over. Voltaggio, I’ve learned, is my age. Or rather – I am his age? The menu for the night was entitled “An Experience of Texture and Flavor” and I figured – I’ve never been afraid of either. The plates featured cooking so modern that the egg you see above isn’t even actually an egg. It’s a consistency made from parmesan and sure as heck tasted like egg. The tartare stack tasted delicious. That gooey consistency was heavenly (besides – over-easy is how I prefer my eggs) and the overall dish was light and refreshing. Oh. 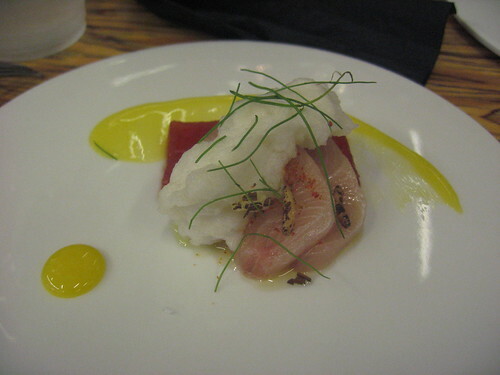 Hamachi. Texture so tender yet airy – smoked yolk to contrast. The most surprising element of the dish was the crisp wild rice. A small yet drastic accent to the tender fish. The veal sweetbreads with poached egg, pea consommoe and coffee-cardamom soil was a savory delight and the crispy chicken thigh with cuttlefish, green garlic [foam] and sweet and sour mushrooms was another appropriately calculated mix in textures. After all – texture and flavor was the theme for the night. So tender was this slab of beef, with the help of its marbled yet tender texture – it practically melted in my mouth. 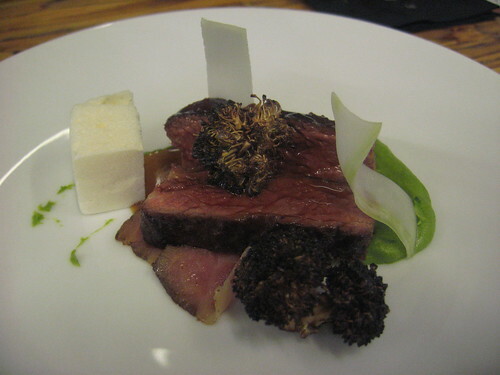 The pastrami was a base salty layer and the real complimentary textures of the plate featured the white horseradish blocks of “styrofoam” against the broccoli. The broccoli actually came in two different forms – “done” florets against a green sauce. So interesting and ultimately delicious. And then came time for dessert. This was the better of the two that night. The fool’s gold – which also had hazelnut praline, salty caramel and nitro coffee mousse – tried to do too many things at once. It was too salty yet sweet (caramel plus hazelnut) and didn’t taste as if it could commit to any given direction. 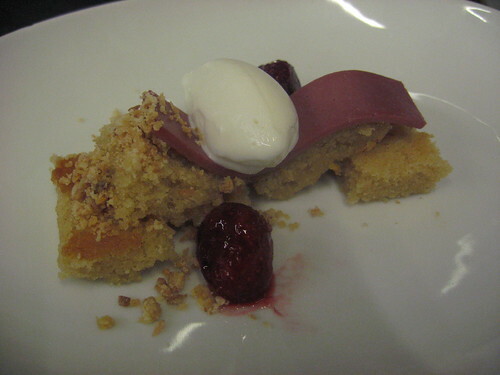 But the miso cake was such an interesting mix – I think, with a slab of what seemed like spam. Whatever it was, it served as good middle ground between the sweet of the strawberry and “rice cream” and saltiness of the breads. In general, this was a delightful experience. Despite the slow service between the last of our savory dishes and the dessert – the multiple pairings of beer, wine and port our table received as compensation helped ease the wait. It seemed as though we may have had special attention because some others who had gotten seated earlier finished pretty close to the time we did. 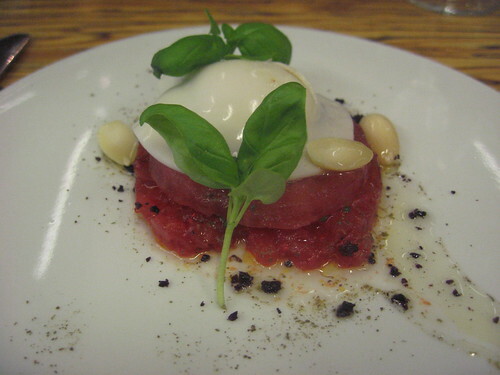 I appreciated Hatchi as an affordable way to enjoy cuisine that would, at a normal dinner, be priced out of my reach. It’s worth the adventure and though I wasn’t able to make the last (with Roberto Cortez), my palate is eager to try the next! …Not before tonight, however. I’ll be trekking to Pasadena to visit Voltaggio’s present home at The Dining Room inside The Langham Pasadena for a media dinner. (Just this past year, it was The Bazaar inside SLS Hotel.) I can’t wait to get a full dosage of his magic. This entry was posted in Century City, Food and tagged Breadbar, Century City, Hatchi, Langham Pasadena, Michael Voltaggio, The Dining Room, Top Chef. Bookmark the permalink.